Start of a new year, 2017! I know I was not baking much for last year and this year, I hope to set things right! I really hope to keep to my resolution of uploading one recipe a week. Baking and sharing recipes are things I do to keep myself sane amidst my work and other chores. It is like a personal me-time. Since I enjoy these times so much, I promised myself that I shall work much harder to keep to this resolution of mine this year. I hope, I really hope so. 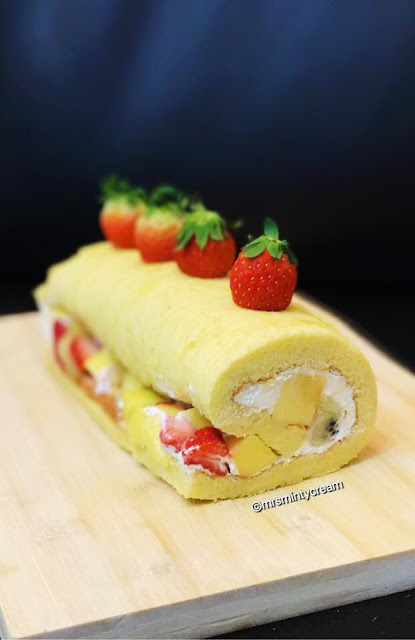 This is the second week of the year and I am starting my year with a Fruity Swiss Roll bake. I bought some really fresh good eggs from the wet market the other day and I was excited to use them in my bakes. Considering the fact that most of the eggs I used in my baking/cooking were bought from supermarket, this batch from the wet market was indeed different. They were much larger in size and the yolks were of a much fresher and brighter colour. It also gives the cake a really fragrant eggy smell when it is done. Love it! Nothing beats fresh and premium ingredients. Will be trying out more versions of the Swiss Roll next. I think they make pretty good breakfast items as well as after-dinner dessert. 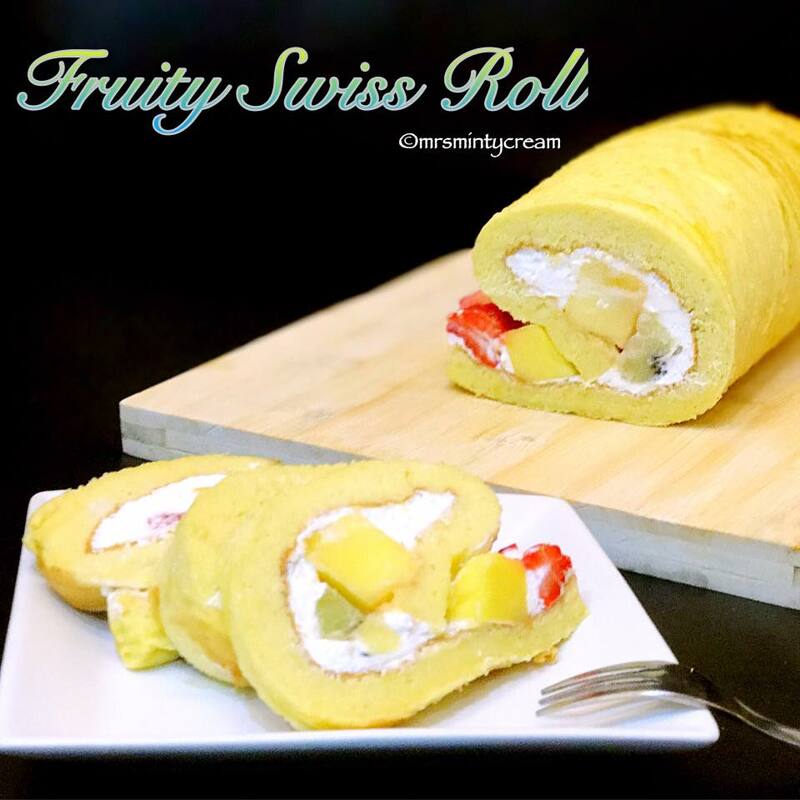 Recipe: Adapted & modified from Ochikeron. 1. Preheat oven to 180C. Line baking tray with baking paper. 2. In a large bowl, beat egg yolks together with milk, oil and vanilla. Mix well. 3. Add in flour and fold it into the yolk mixture using a spatula. Ensure mixture is well combined and smooth. Once combined yolk mixture is done, set aside for later use. 4. In a separate mixer bowl, beat the egg whites until foamy using an electric mixer. 5. Then gradually add in sugar and continue mixing until thick and stiff peak. 6. Once it is done, fold in egg white mixture, one-third portion at a time, into yolk mixture until a well-combined batter is obtained. 7. Pour combined batter into baking tray and ensures that it is evenly spread out. 8. Tap baking tray against tabletop to remove air bubbles from batter. 9. Bake in oven at 180C for about 12 mins or until cake is lightly browned. 10. When cake is done, remove from oven and tap baking tap against tabletop to prevent shrinkage. 11. Remove sponge cake from tray and allow it to cool on cooling rack. Ensure cake is completely cooled before adding filling on the browned side of the cake. 12. To prepare the filling, combine whipped cream with sugar using electric mixer. Beat until soft peak. 13. Spread cream filling over the browned surface of the cake. 14. Top with diced fruits over the creamed surface. Leave a one-inch gap around the border. 15. 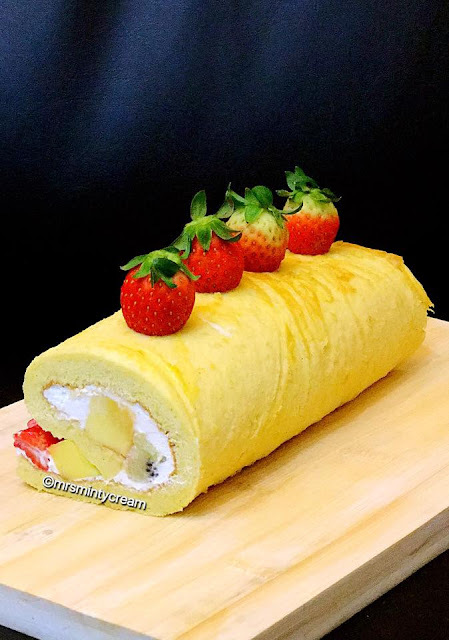 Roll the cake in baking paper and cover with a layer of cling wrap. Rest the cake in fridge for at least 2 hours before slicing and serving. Best served chilled.